National Database & Registration Authority Jobs 2018-19.National Database and Registration Authority NADRA are opening new jobs at multiple cities. Intermediate with Short course in Computer. How to Apply For Nadra Jobs in Sindh 2018-19? Send your application along with CV- photographs- all Educational documents and experienced certificates. 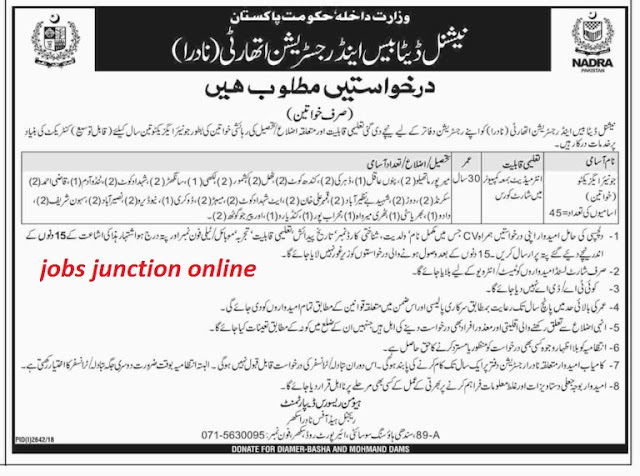 Human Resource Departments, Regional Head office Nadra Sukkur- 89-A, Sindhi Housing Society, Airport Road, Sukkur.